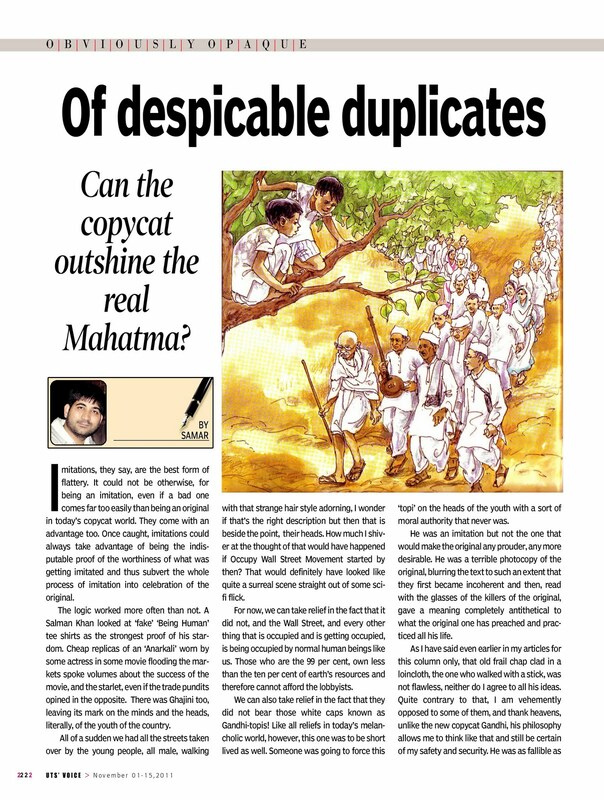 Of Despicable Duplicates: Can the copycat outshine the real Mahatma? Imitations, they say, are the best form of flattery. It could not be otherwise, for being an imitation, even if a bad one comes far too easily than being an original in today’s copycat world. They come with an advantage too. Once caught, imitations could always take advantage of being the indisputable proof of the worthiness of what was getting imitated and thus subvert the whole process of imitation into celebration of the original. The logic worked more often than not. A Salman Khan looked at ‘fake’ ‘Being Human’tee shirts as the strongest proof of his stardom. Cheap replicas of an ‘Anarkali’ worn by some actress in some movie flooding the markets spoke volumes about the success of the movie, and the starlet, even if the trade pundits opined in the opposite. There was Ghajini too, leaving its mark on the minds and the heads, literally, of the youth of the country. All of a sudden we had all the streets taken over by the young people, all male, walking with that strange hair style adorning, I wonder if that’s the right description but then that is beside the point, their heads. How much I shiver at the thought of that would have happened if Occupy Wall Street Movement started by then? That would definitely have looked like quite a surreal scene straight out of some scifi flick. For now, we can take relief in the fact that it did not, and the Wall Street, and every other thing that is occupied and is getting occupied, is being occupied by normal human beings like us. Those who are the 99 per cent, own less than the ten per cent of earth’s resources and therefore cannot afford the lobbyists. We can also take relief in the fact that they did not bear those white caps known as Gandhi-topis! Like all reliefs in today’s melancholic world, however, this one was to be short lived as well. Someone was going to force this ‘topi’ on the heads of the youth with a sort of moral authority that never was. He was an imitation but not the one that would make the original any prouder, any more desirable. He was a terrible photocopy of the original, blurring the text to such an extent that they first became incoherent and then, read with the glasses of the killers of the original,gave a meaning completely antithetical to what the original one has preached and practiced all his life. 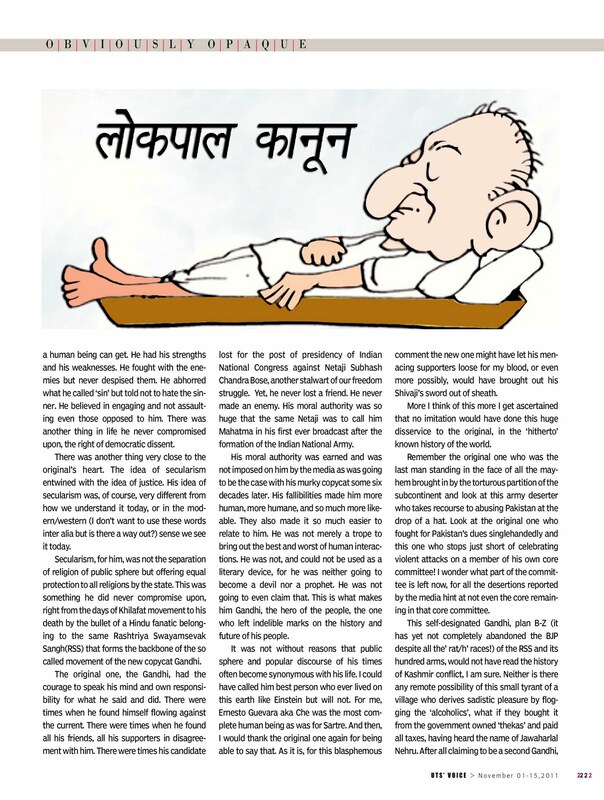 As I have said even earlier in my articles for this column only, that old frail chap clad in a loincloth, the one who walked with a stick, was not flawless, neither do I agree to all his ideas. Quite contrary to that, I am vehemently opposed to some of them, and thank heavens, unlike the new copycat Gandhi, his philosophy allows me to think like that and still be certain of my safety and security. He was as fallible as a human being can get. He had his strengths and his weaknesses. He fought with the enemies but never despised them. He abhorred what he called ‘sin’ but told not to hate the sinner. He believed in engaging and not assaulting even those opposed to him. There was another thing in life he never compromised upon, the right of democratic dissent. There was another thing very close to the original’s heart. The idea of secularism entwined with the idea of justice. His idea of secularism was, of course, very different from how we understand it today, or in the modern/western (I don’t want to use these words inter alia but is there a way out?) sense we see it today. Secularism, for him, was not the separation of religion of public sphere but offering equal protection to all religions by the state. This was something he did never compromise upon, right from the days of Khilafat movement to his death by the bullet of a Hindu fanatic belonging to the same Rashtriya Swayamsevak Sangh(RSS) that forms the backbone of the so called movement of the new copycat Gandhi. 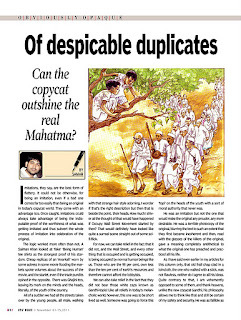 The original one, the Gandhi, had the courage to speak his mind and own responsibility for what he said and did. There were times when he found himself flowing against the current. There were times when he found all his friends, all his supporters in disagreement with him. There were times his candidate lost for the post of presidency of Indian National Congress against Netaji Subhash Chandra Bose, another stalwart of our freedom struggle. Yet, he never lost a friend. He never made an enemy. His moral authority was so huge that the same Netaji was to call him Mahatma in his first ever broadcast after the formation of the Indian National Army. His moral authority was earned and was not imposed on him by the media as was going to be the case with his murky copycat some six decades later. His fallibilities made him more human, more humane, and so much more likeable. They also made it so much easier to relate to him. He was not merely a trope to bring out the best and worst of human interactions. He was not, and could not be used as a literary device, for he was neither going to become a devil nor a prophet. He was not going to even claim that. This is what makes him Gandhi, the hero of the people, the one who left indelible marks on the history and future of his people. It was not without reasons that public sphere and popular discourse of his times often become synonymous with his life. I could have called him best person who ever lived on this earth like Einstein but will not. For me, Ernesto Guevara aka Che was the most complete human being as was for Sartre. And then, I would thank the original one again for being able to say that. As it is, for this blasphemous comment the new one might have let his menacing supporters loose for my blood, or even more possibly, would have brought out his Shivaji’s sword out of sheath. More I think of this more I get ascertained that no imitation would have done this huge disservice to the original, in the ‘hitherto’known history of the world. Remember the original one who was the last man standing in the face of all the mayhem brought in by the torturous partition of the subcontinent and look at this army deserter who takes recourse to abusing Pakistan at the drop of a hat. Look at the original one who fought for Pakistan’s dues singlehandedly and this one who stops just short of celebrating violent attacks on a member of his own core committee! I wonder what part of the committee is left now, for all the desertions reported by the media hint at not even the core remaining in that core committee. This self-designated Gandhi, plan B-Z (it has yet not completely abandoned the BJP despite all the’ rat/h’ races!) of the RSS and its hundred arms, would not have read the history of Kashmir conflict, I am sure. Neither is there any remote possibility of this small tyrant of a village who derives sadistic pleasure by flogging the ‘alcoholics’, what if they bought it from the government owned ‘thekas’ and paid all taxes, having heard the name of Jawaharlal Nehru. After all claiming to be a second Gandhi,or a third JP or a fourth Hitler is far easier than serving the punishment of staunchly secular Nehru, isn’t it? Had he read him, he might have seen the case in a different light. Let’s forget the merits of the case Prashant Bhushan espoused for a moment though. Let’s just remember the Honourable Supreme Court’s recent pronouncement that one cannot be convicted even for the ‘membership’ of a ‘proscribed’ organization if s/he is not inciting or engaged in acts of violence. So even if, I repeat, even if Bhushan’s comments were ‘anti-national’, was the attack on him justified? Who listens to the Supreme Court though? Definitely not the ones who are the court, the law, the constitution and even the people unto themselves? Nay, they are above than them all, as his lieutenant who is yet to come clean on his NGO’s accounts claimed. They are the ones who will never, for once,think of Babasaheb Ambedkar and realizing their folly one fine day, they would invite two girls a Dalit and a Muslim to offer juice to that copycat, forgetting the fact they are marking the girls for their lives. 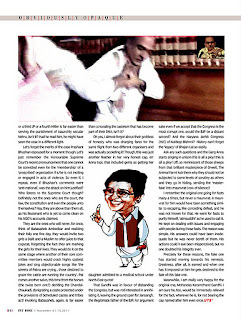 They would do it on the same stage where another of their core committee members would crack highly casteist jokes and sing objectionable songs like ‘the streets of Patna are crying , those destined to graze the cattle are running the country’. Pat comes another salvo, this time from the horses (the twice born one?) deriding the Chandal- Chaukadi, denigrating a caste protected under the provisions of Scheduled castes and tribes act! Invoking Babasaheb, again, is far easier than concealing the casteism that has become part of their DNA, isn’t it? Oh yes, I almost forgot about their goddess of honesty who was charging fares for the same flight from two different organisers and was actually pocketing it! Though, this was just another feather in her very honest cap, err Anna topi, that included gems as getting her daughter admitted to a medical school under North-East quota! 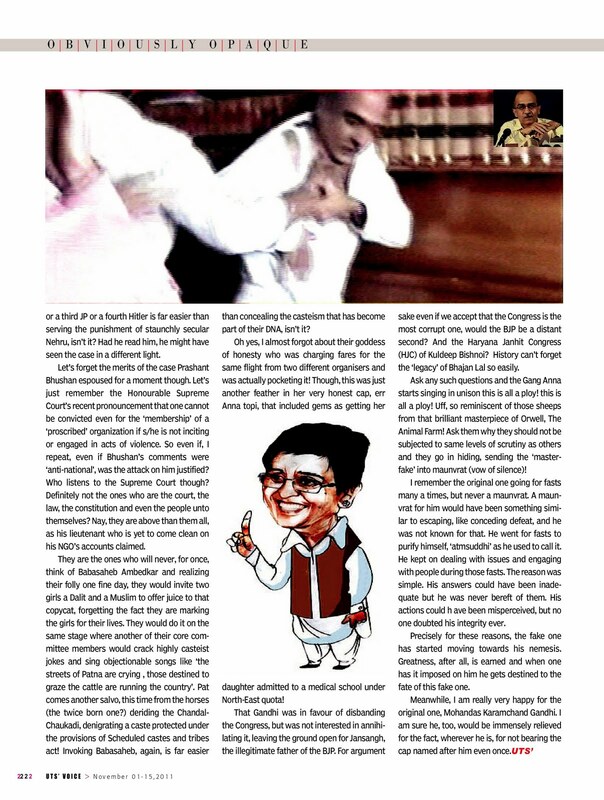 That Gandhi was in favour of disbanding the Congress, but was not interested in annihilating it, leaving the ground open for Jansangh, the illegitimate father of the BJP. For argument sake even if we accept that the Congress is the most corrupt one, would the BJP be a distant second? And the Haryana Janhit Congress (HJC) of Kuldeep Bishnoi? History can’t forget the ‘legacy’ of Bhajan Lal so easily. Ask any such questions and the Gang Anna starts singing in unison this is all a ploy! this is all a ploy! Uff, so reminiscent of those sheeps from that brilliant masterpiece of Orwell, The Animal Farm! Ask them why they should not be subjected to same levels of scrutiny as others and they go in hiding, sending the ‘masterfake’ into maunvrat (vow of silence)! I remember the original one going for fasts many a times, but never a maunvrat. A maunvrat for him would have been something similar to escaping, like conceding defeat, and he was not known for that. He went for fasts to purify himself, ‘atmsuddhi’ as he used to call it. He kept on dealing with issues and engaging with people during those fasts. The reason was simple. His answers could have been inadequate but he was never bereft of them. His actions could h ave been misperceived, but no one doubted his integrity ever. Precisely for these reasons, the fake one has started moving towards his nemesis. Greatness, after all, is earned and when one has it imposed on him he gets destined to the fate of this fake one. Meanwhile, I am really very happy for the original one, Mohandas Karamchand Gandhi. I am sure he, too, would be immensely relieved for the fact, wherever he is, for not bearing the cap named after him even once.